Our primary aim is to protect eco-systems and use resources efficiently, so that we can create significant value for customers, shareholders and the environment. We cleared no primary forest in 2017. Further, we recorded no degradation of High Conservation Value (HCV) land in the 12 month period. Our Policy aims to prevent deforestation and conserve High Conservation Value (HCV) and High Carbon Stock (HCS) areas. We commit to ensure that there is no new development in HCV areas within our operations and to buying palm oil from smallholders/external suppliers that does not originate from areas cleared of primary forest since 2011. Prior to any new planting we use the HCS Approach Toolkit which allows estates to quantify carbon stocks of assets and gauge FPIC in the community. We conduct HCV training for independent smallholders as part of the collaborative project with IDH Sustainable Trade Initiative. Each HCV team has a formal dialogue process with relevant stakeholders about HCV land management, including monitoring, wildlife, signage, borders, and any disturbances. We will regularly communicate with employees and local communities living around our estates the importance of the HCV areas and the restriction of activities such as hunting, trapping or trafficking of wild animals within them or adjacent to them. The hunting and poaching of wildlife, including rare, threatened and endangered species are prohibited within our plantations. In the last 12 months our records show that new planting was avoided and water levels were maintained in peatlands under our control. For established plantations, our Sustainable Palm Oil Policy 2017 aims to ensure the implementation of Best Management Practices for peat to manage and improve the ecological functions of peatland within and adjacent to our concessions. Where our assets are RSPO-certified, peatland is protected, and we meet the requirements of the new Indonesian Government Regulation (no. 71/2014) that prohibits clearing new land for cultivation, cutting drainage channels that may dry out peat, intentionally burning peatlands and other activities that risk damage to peat. During an HCV assessment we do on site work and then plan the monitoring and management required. 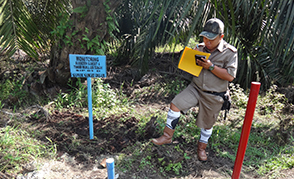 Peat water measurement is part of the field work, along with signage, survey markings and species rehabilitation. Our research team runs continuous water level monitoring in all of our estates. This includes peat subsidence measurement, GIS/GPS water level remote sensing, 3D flood risk modelling and water level forecasting. We have improved capture of overflow from roads for use as irrigation during drier periods; it also helps maintain the appropriate water depth depending on local circumstances. During 2017, our analysis indicated an improved level of fire risk control on assets we manage. We delivered 223 fire control training days in 2017. The Indonesian government wants stricter fire controls and declared emergency status in some areas in 2017, and some Provinces delivered some impressive fire prevention actions this year. 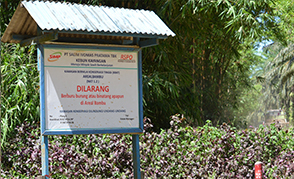 The way IndoAgri controls fires is systematic and reliant on local engagement. In 2017 we once again worked with local government, village chiefs, and local communities to build local capacity and knowledge to prevent fires. Our fire towers, new equipment and training are helping and operational teams ensure that land preparation is done mechanically so that good practice is shared. Every land transaction in which IndoAgri is involved complies with Indonesian law and company policy. We remain steadfast in our commitment to manage operations that respect the principles of Free Prior and Informed Consent (FPIC). We continue our work to be a welcomed member of the community who actively engages with and listens to local stakeholders, while making a positive contribution. During planting we aim to clarify land ownership and land rights. It makes good business sense to ensure that our process does not threaten supply resilience and RSPO certification process helps us to ensure that engagement, land rights and ownership are respected. Also, community relations are part of HCV management, at the core of building trust and consent. Each HCV assessment and management team has a formal dialogue process with relevant stakeholders about HCV and land management. Our Environmental Management Systems (EMS, which follows ISO14001), Enterprise Risk Management framework and Whistleblowing mechanism are in place to ensure compliance with the relevant requirements and manage environmental risks. Some 65% of palm oil mills and estates have an EMS in place. In 2017, we have 16 mills, 1 refinery, 1 bulking station certified against ISO 14001 standard. We aim to certify our mills and refineries by end 2019. Some 99% of milling fuel and 6% of refinery fuel is renewable. Energy consumption per tonne FFB processed (energy intensity) at our mills fell to 3.12 GJ/tonne in 2017 (3.19 in 2016) while at our refineries, remain stable since 2015. This is what a benchmark site looks like! The Ministry of Environment and Forestry, along with other relevant partners, is developing GHG emission tools and a national default value for the palm oil sector. One of our Lonsum RSPO sites was selected as a benchmark site in this work. The data will help companies improve their GHG calculations and will help the government to understand environmental performance in the agribusiness sector. The primary GHG emission source at IndoAgri is land conversion: measurable changes in carbon stock during the development of plantations. We note that 24.9% of IndoAgri's GHG emissions are the result of low-level methane emissions from peat, rather than from its disturbance. Other sources are from burning fuels, POME emissions and nitrous oxide emissions from fertilisers. Total net emissions in 2017 for each tonne of CPO and palm kernel (PK) were 1.54 tonnes CO2e (2016: 1.79 tonnes CO2e). Emissions related to transport of CPO to four refineries were 0.07 tonnes CO2e per tonne CPO transported (2016: 0.05 tonnes CO2e/tonne CPO). 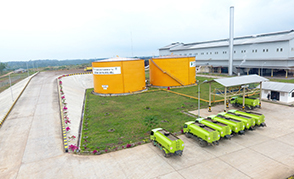 Our three aerated bunker composters (including one at our new Kencana Sari mill) continue to reduce methane emissions by 30%-70% compared with standard composting. Our plantations are entirely watered by rainfall, 84% of mill water is from rivers; 75% of refinery water is from municipal sources; the proportions from groundwater and reverse osmosis are 23% and 2% respectively. Reverse Osmosis at CPO Refinery. 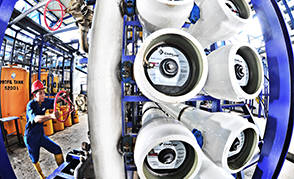 Part of an early capital investment at Tanjung Priok refinery was to supply water using sea water desalination technology. Reverse osmosis (RO) is a water purification technology that uses a semipermeable membrane to remove ions, molecules, bacteria and larger particles from sea water. Demand for palm oil continues to grow globally, but oil palm is an efficient and high-yielding crop. We continue our efforts to maximise that yield at nucleus and plasma plantations and with independent smallholders. Whilst we administer fertiliser during planting and replanting we also use leguminous cover crops to manage atmospheric nitrogen and improve the soil. We also recycle empty fruit branches (EFB) and POME for use as a soil improver. 89% of total volume fertiliser used is organic. We have stopped the use of Paraquat since the end of March 2018 in all of our operations. 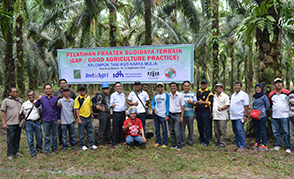 IndoAgri complies with government regulations (Komite Pestisida) on restricted pesticides. Barn Owls.In 2017 we celebrated 20 years of breeding Barn Owls for natural, biological rodent control! 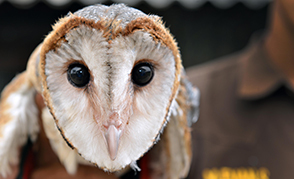 Each year, some 9,500 owlets are produced in our Riau estates, for example. See our Reports for more. Click here to see our management approach and material topics. Certification is a key tool to help deliver on our Policy goals on deforestation, peatland, burning and human rights. Please see detail on sourcing targets. Click here for the 2017 list of Red List species.